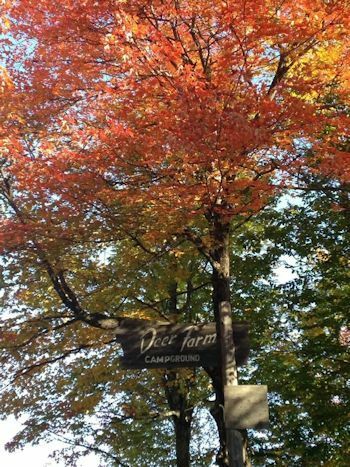 Deer Farm Campground is a family-oriented seasonal campground located on 50 acres in Kingfield, Maine, gateway to the Sugarloaf Mountain Resort and home of the Stanley Steamer. This picturesque town is nestled in the Carrabassett River Valley, surrounded by the beautiful mountains of Western Maine. We open for the season on MAY 16th and close for the season on Columbus Day Weekend. Deer Farm Campground is the perfect spot to disconnect from today's hectic world. While offering basic amenities, the campground does not provide internet access or satellite TV. Each campsite offers water and electric, a fire ring and grill. The bathhouse, located centrally to our campsites, provides free hot showers and restroom facilities. Our rustic cabins offer the comfort of a roof and four walls, running water and electricity but still offer the experience of "roughing it". A welcoming lounge area serves as a gathering place for campers or simply a place to read while waiting for your laundry. A small store is stocked with basic essentials including firewood, ice and snacks. An old-school game room is equipped with a 25 cent pool table, ping pong table and foosball. There is a beautiful private beach on Tufts Pond, just a short walk away for campground guests.